We’ve got a nice, easy Cover Competition for you this month; all you have to do is name the frozen canal featured on this month’s cover. 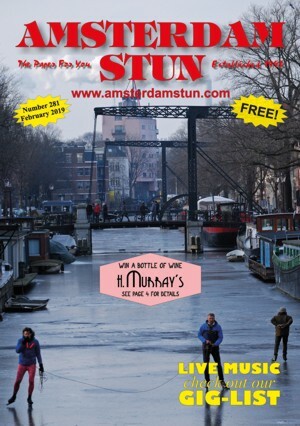 Our good friends at H. Murray’s have generously donated a bottle of (red or white) house wine as a prize, so if you know the answer, send it to cover@stun.nl by Monday 25th February and the winner will be selected from all of the correct entries. We didn’t get any correct entries for last month’s Cover Competition; a couple of you thought it was called the Spider, but its actual name was A.N.N. (Artificial Neural Network) and I took the photo from Raadhuisstraat. Molly Malone’s held their final monthly Quiz Night in January, so Joanna from team “Cat on a Leash” baked some brownies to mark the occasion, much to the surprise of quiz master Steven. The quiz was fully booked the day it was announced, with all of the best teams, past and present, wanting to take the honour of winning the very last one. As it was a special night, there were no cash prizes; all of the entry fees went to child cancer charity KiKa and there were trophies and medals up for grabs instead. Colin, Denise, Majella, Pete and Lin make a formidable team, but they don’t get to Molly’s as often as they used to, so they dropped a couple of points on the photo round: Molly’s bar staff, past & present. They came second out of 18 teams, two points behind the winners! Thanks to our superior bar staff knowledge, it didn’t come down to a tie-break, so it was Sid, Josie, Lesley and myself who picked up the winner’s trophy from Brian and Steven. I’m going to miss Molly’s Quiz Nights; they had the right mix of fun, competitiveness and prizes that we haven’t found in other bars yet, but we’ll keep looking. You might notice that this month’s edition is a bit thinner than usual; that’s because it was dead around town in January, so I haven’t got as many photos as usual, but everything else is here, so enjoy your Stun.